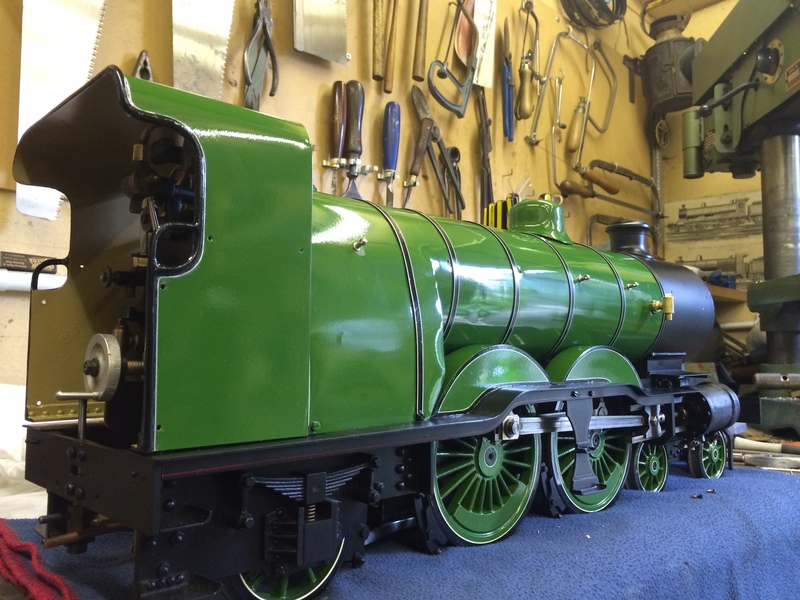 We completed this re-paint / re-build back in 2014, and she is now enjoyed regularly with her new owner Sam, who has a great blog site that you might like to follow. 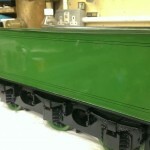 Essentially this was just a fairly straight forward repaint to the customers specification. 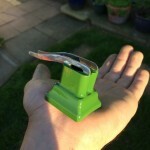 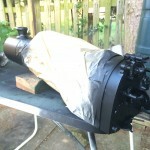 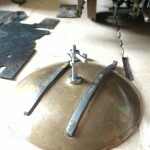 Take apart as little of the model as reasonably possible (most of it as it usually turns out! 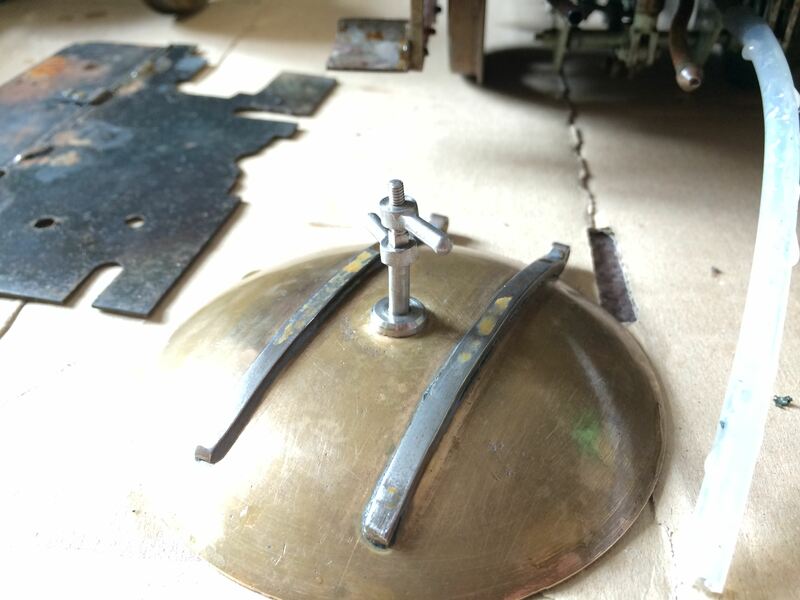 ), strip off all the old paint, bead blast where possible the metal to create a great key for the paint, and then etch prime, paint and line. 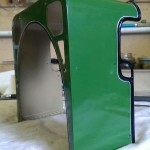 Here’s just a little gallery of how the project has been progressing over the last couple of weeks. 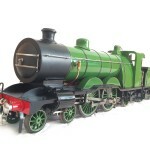 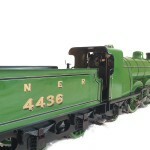 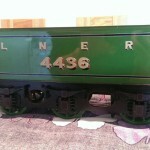 This is how the loco came to us. 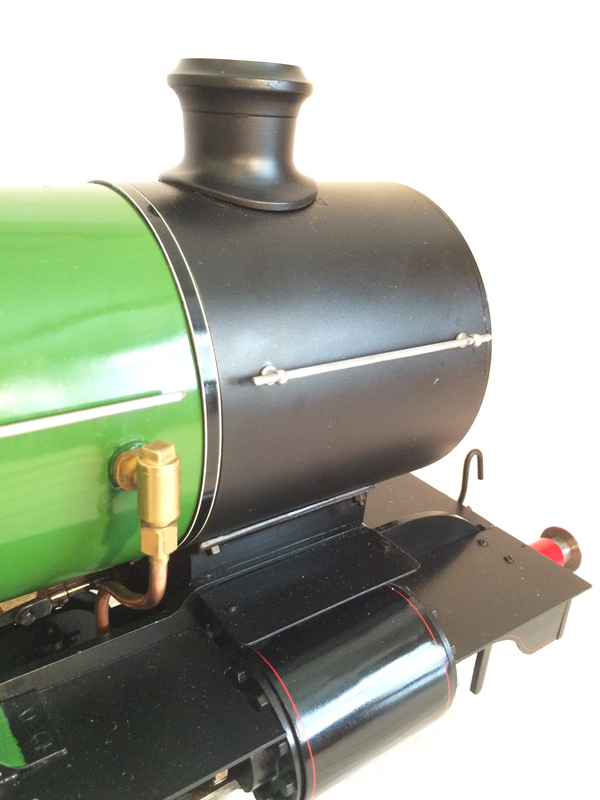 Brand new, unsteamed and nicely built. 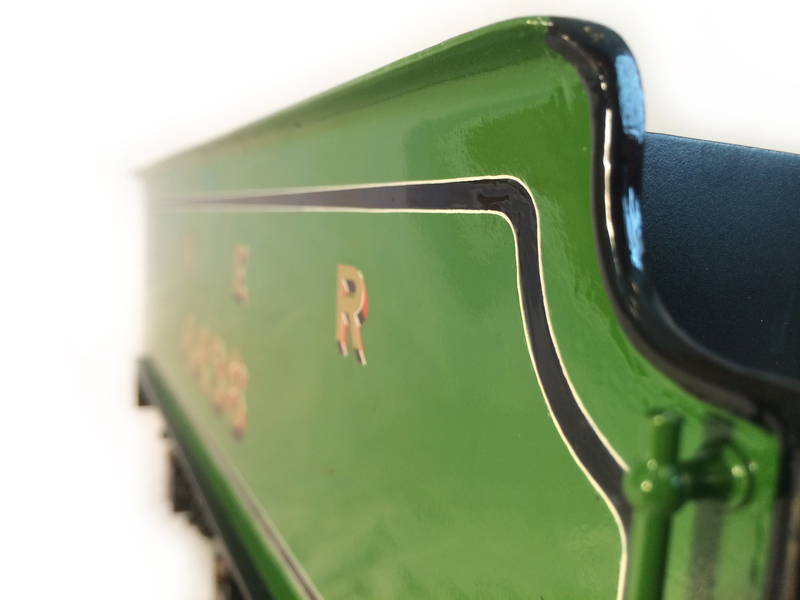 But in some odd and badly applied colour scheme. 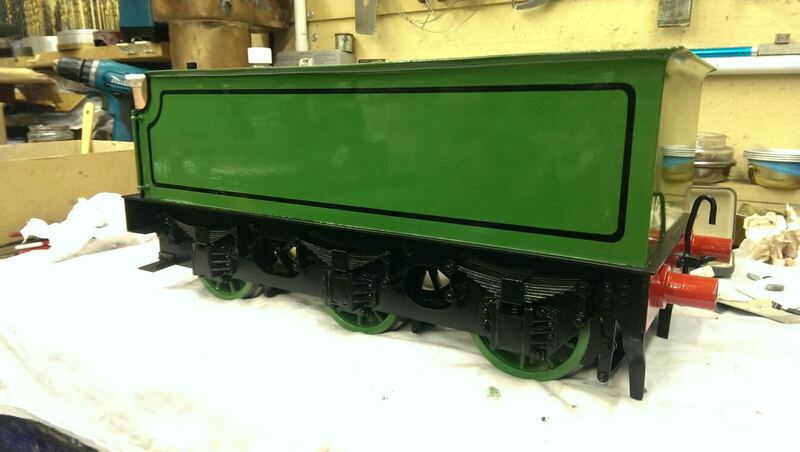 So the strip down and re-paint began! 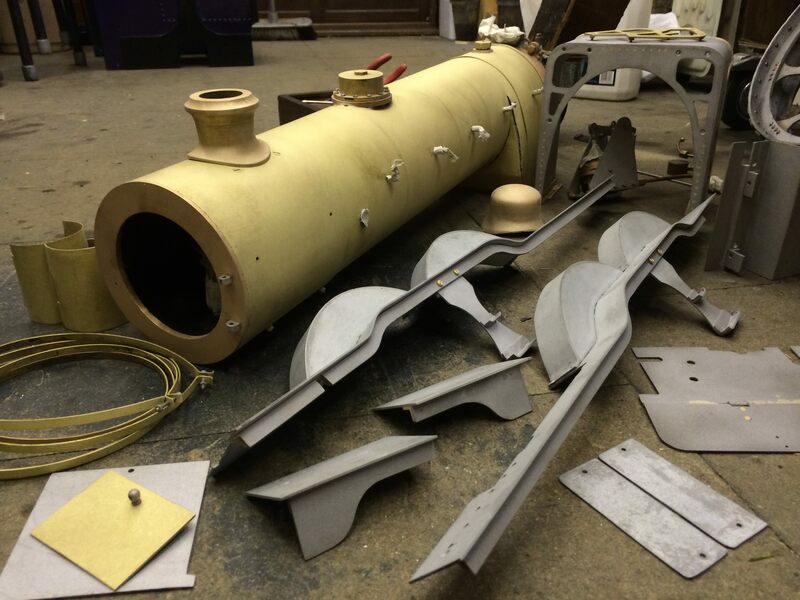 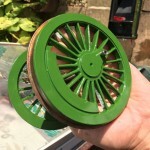 Next all the stripped down and de-painted parts are bead blasted where appropriate, to thoroughly clean them, but also to prepare the surfaces as a great key for our application of metal etch primer. 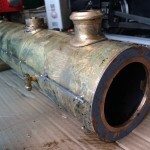 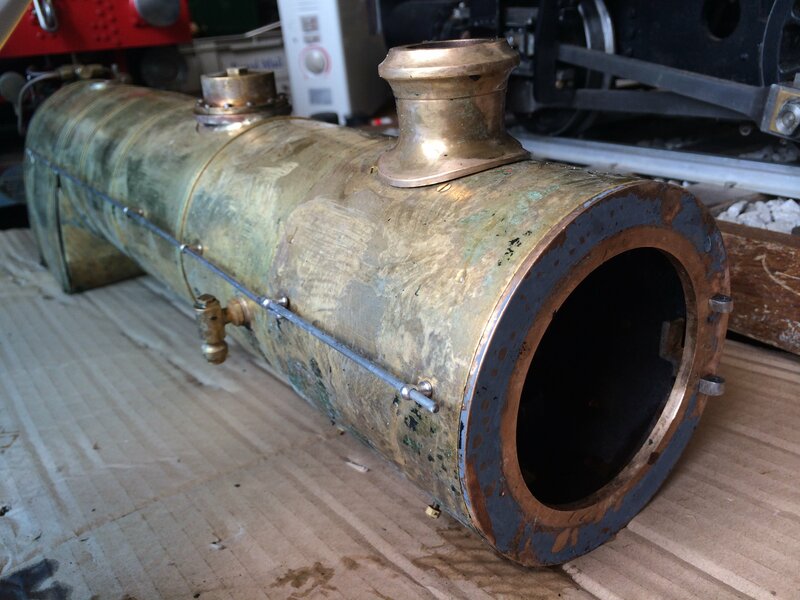 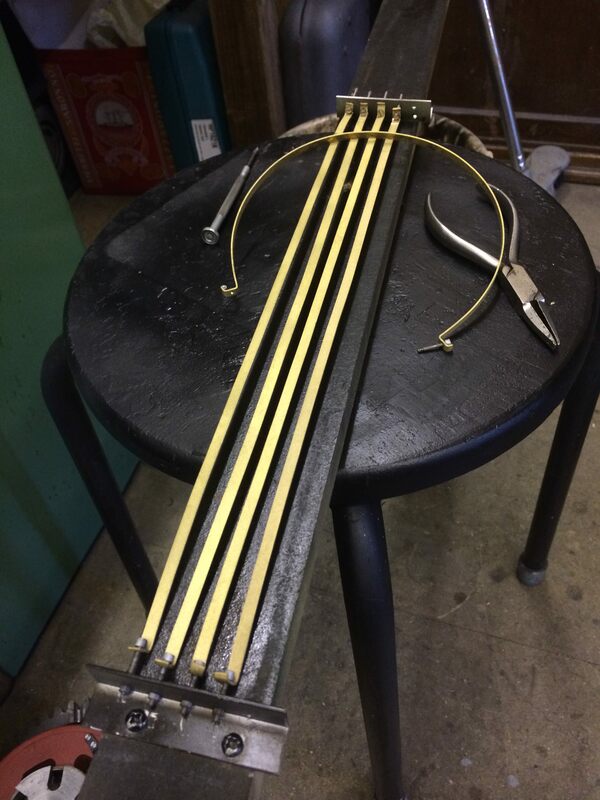 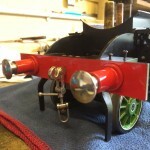 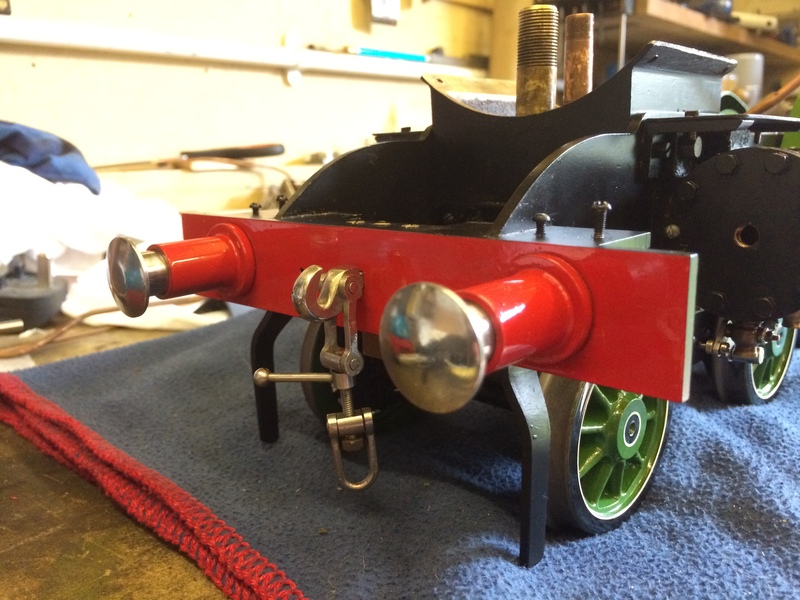 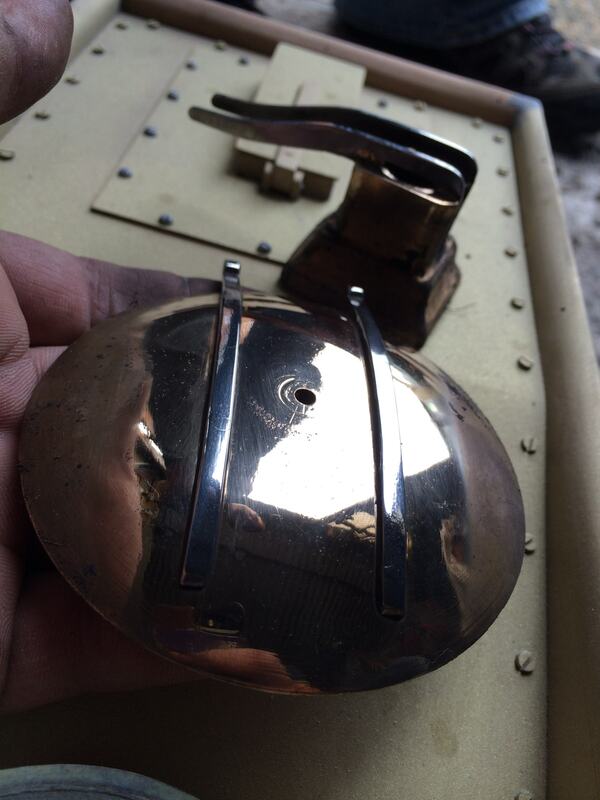 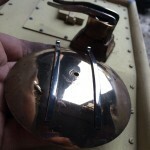 Some parts like the smoke box door, needed to have polished straps, and so they were polished up first, before selective masking, and subsequent blasting with the beads. 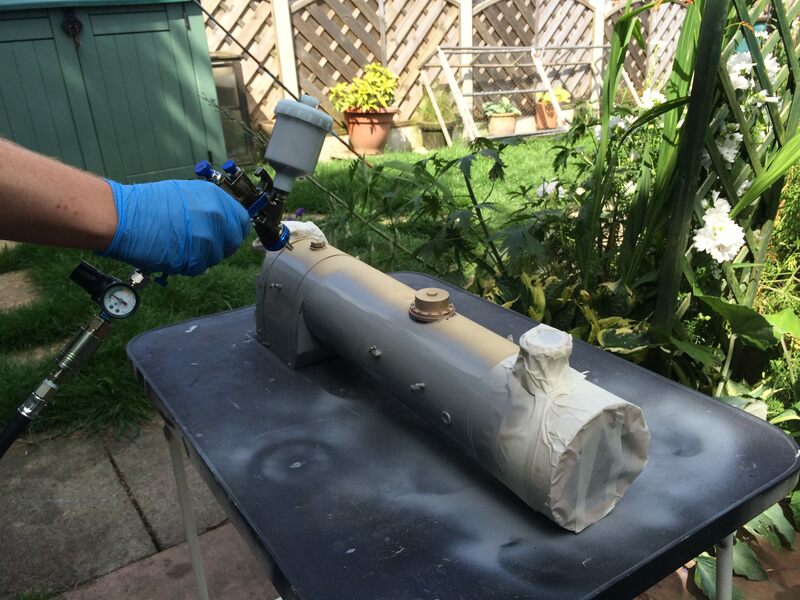 Then after careful masking the majority of the rest of the parts were etch primed. 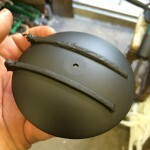 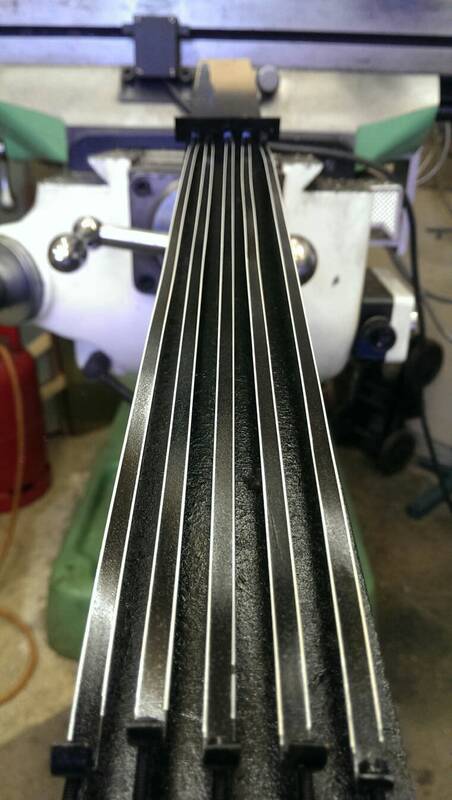 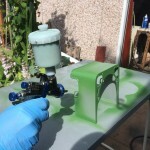 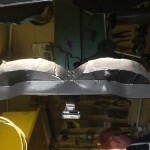 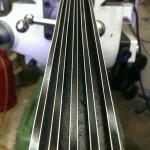 Some of the high temperature bits, don’t receive primer, the HT black being applied directly to the bead blasted surface. 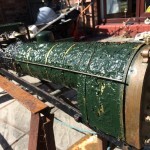 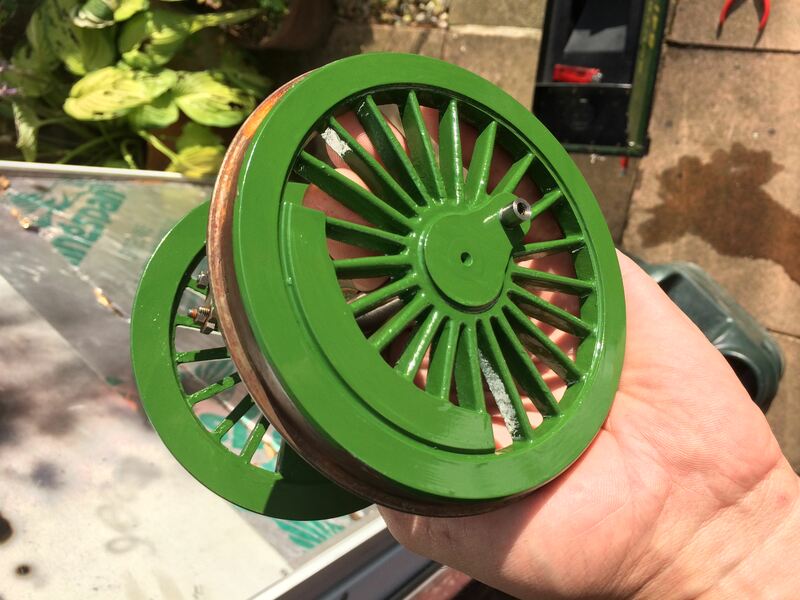 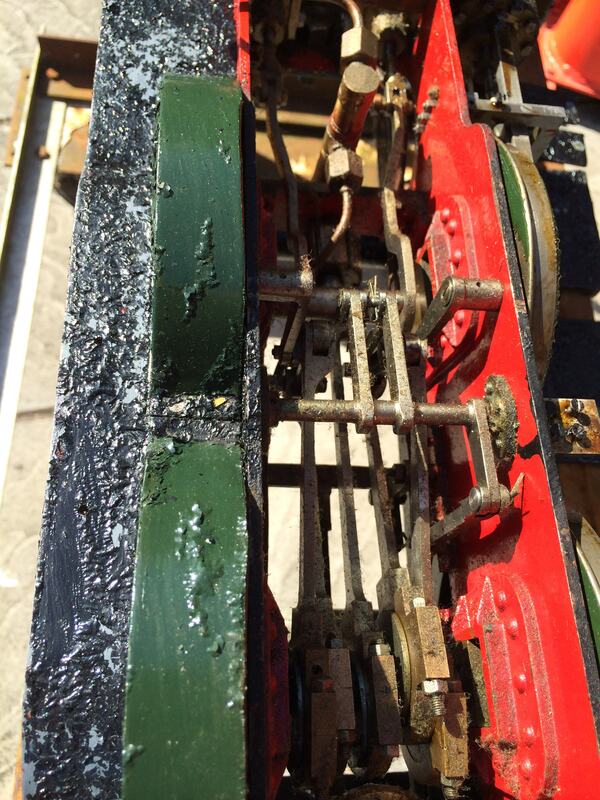 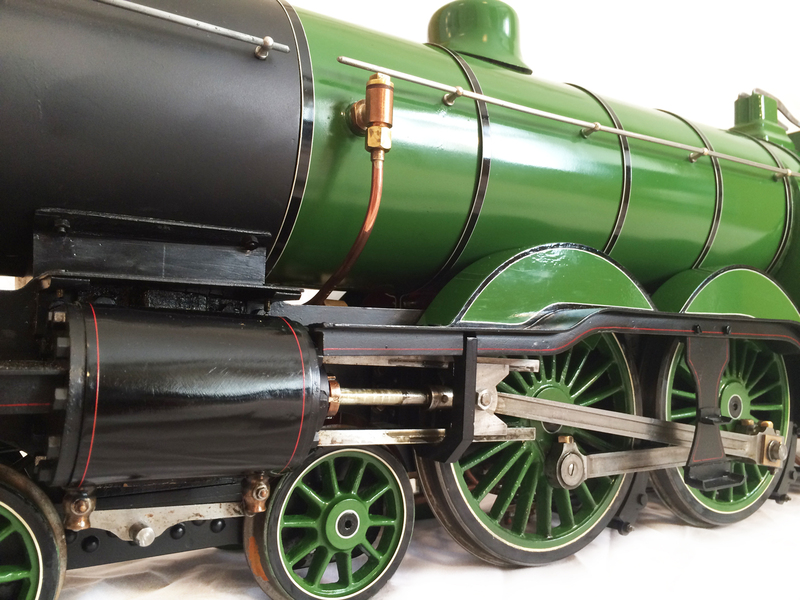 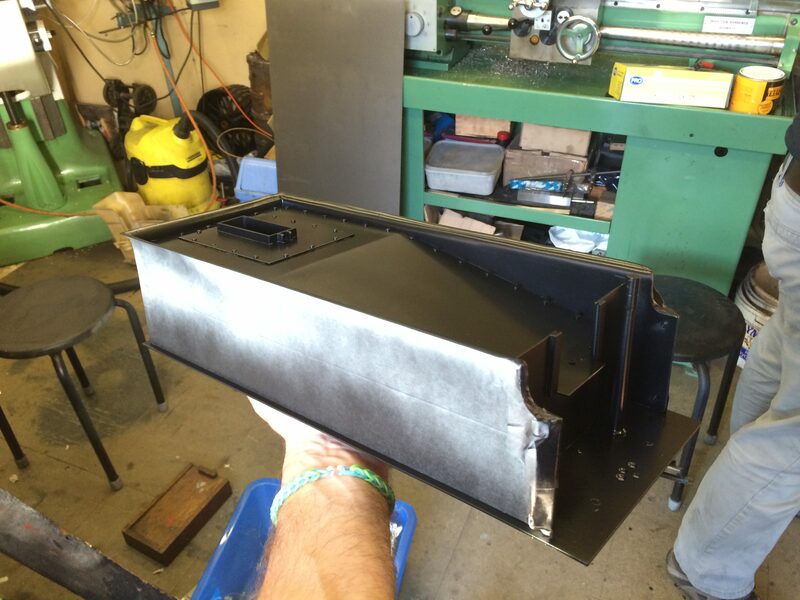 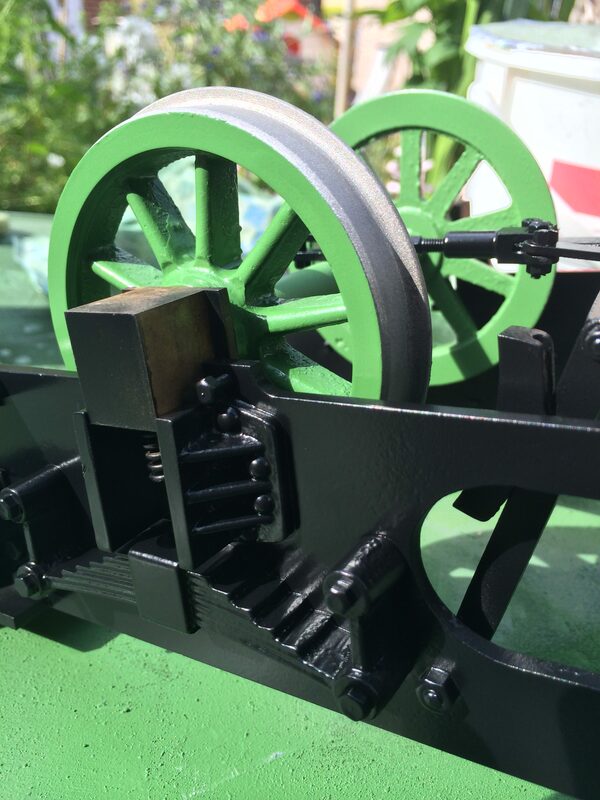 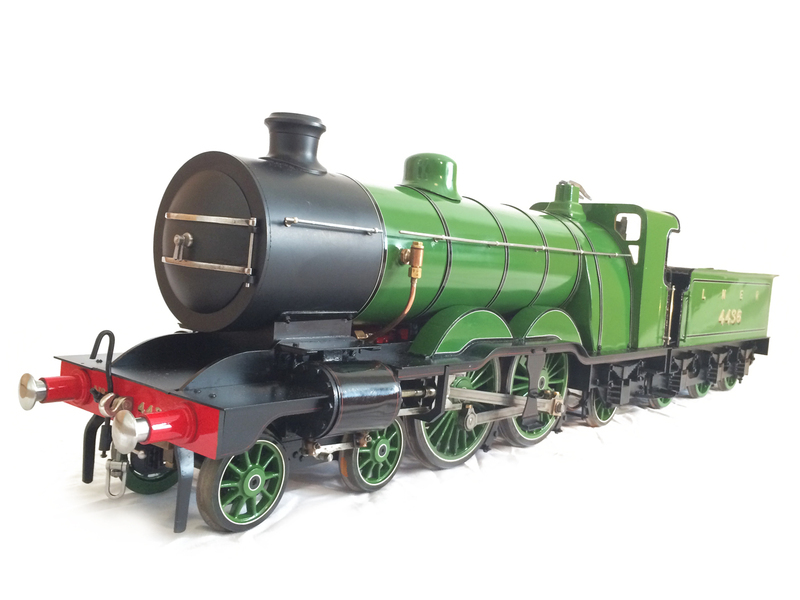 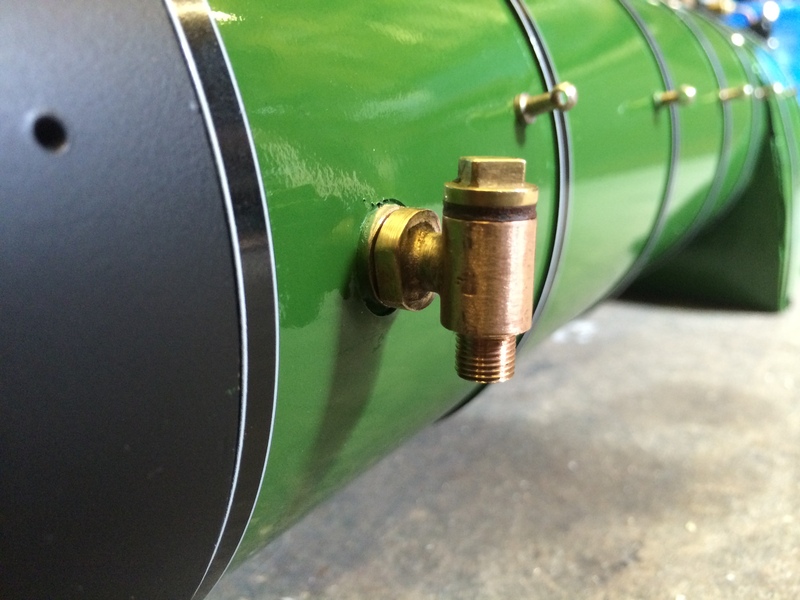 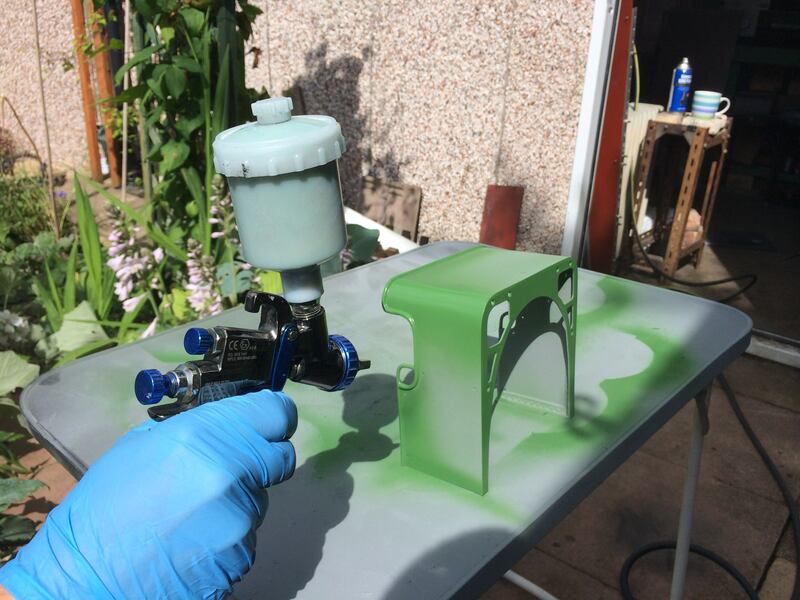 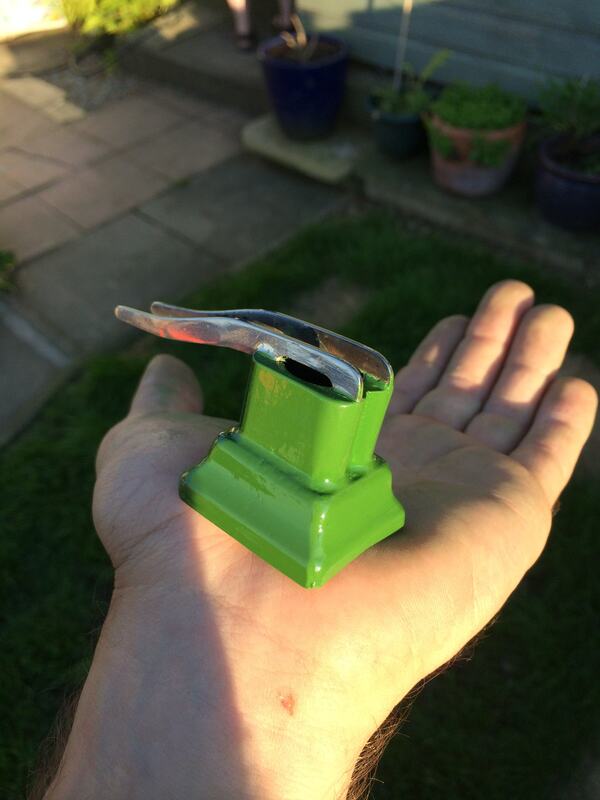 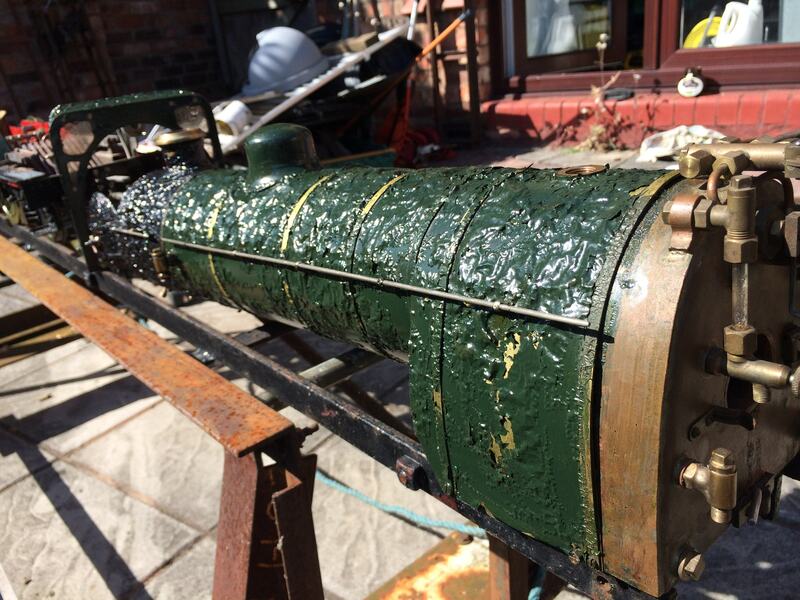 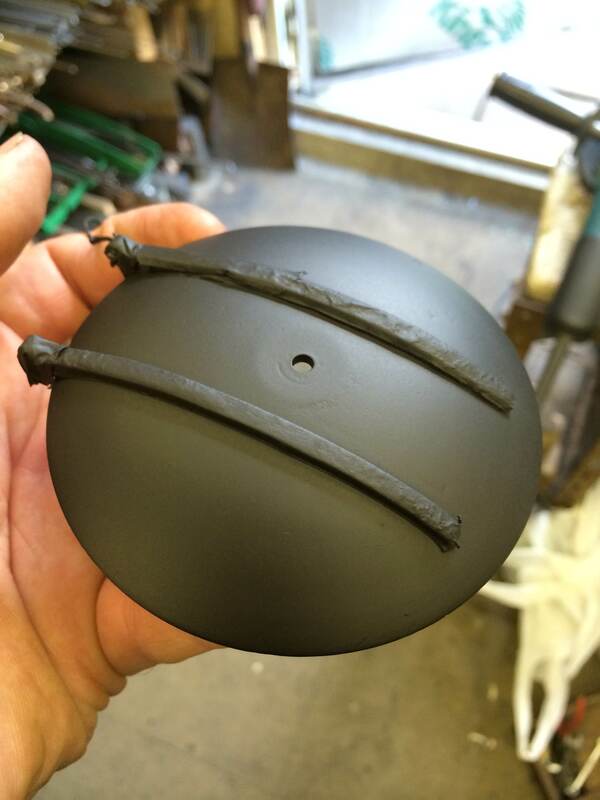 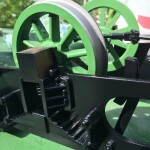 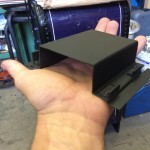 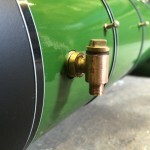 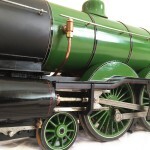 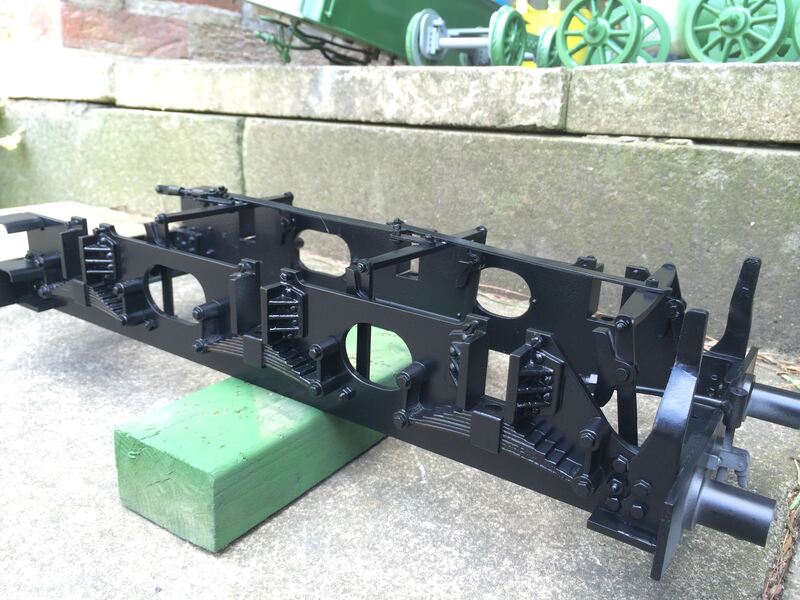 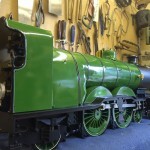 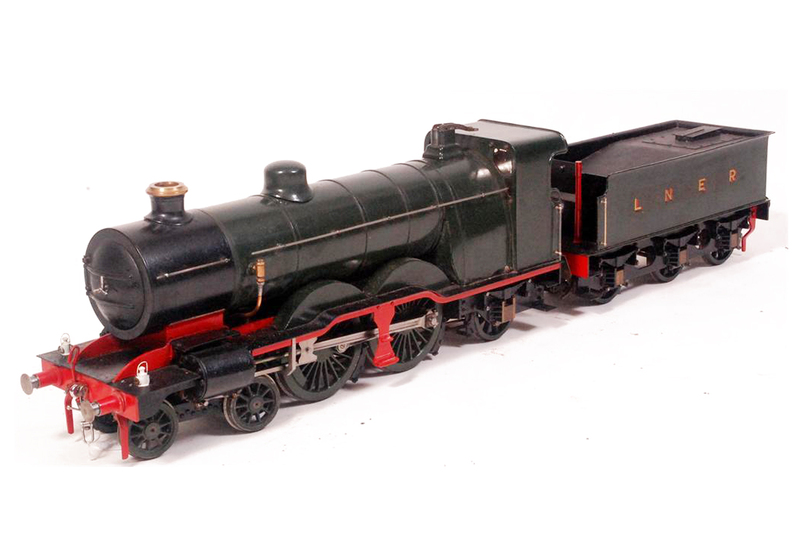 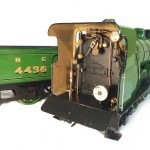 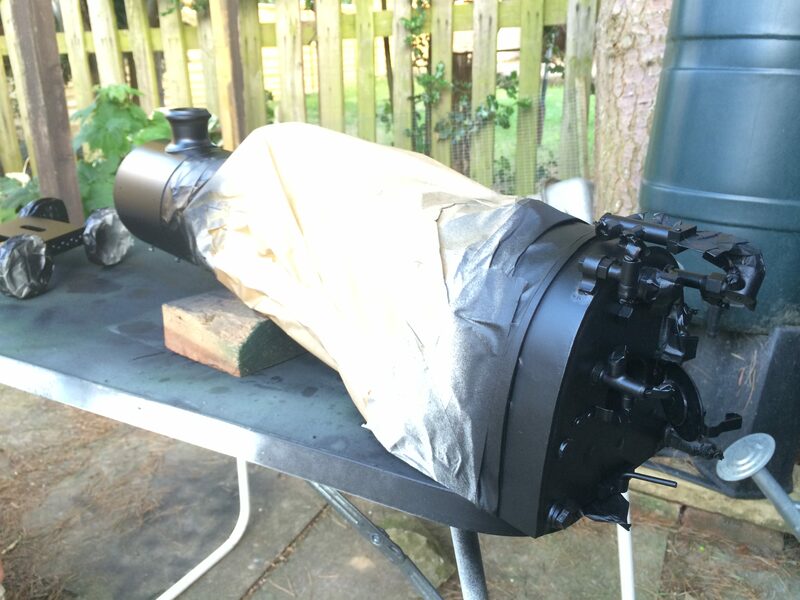 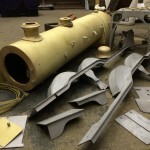 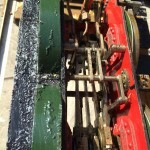 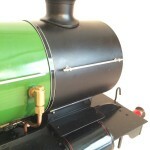 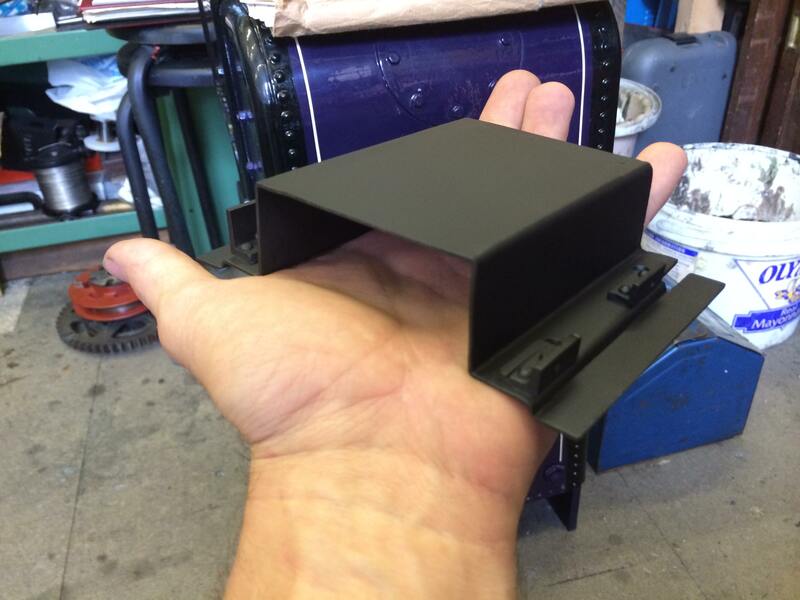 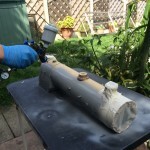 Primers wouldn’t take the high temperatures experienced in areas such as the smoke box, backhead and ashpan, so in these areas we use HT stove paint, and usually as it looks more appropriate we aim for a matt black finish. 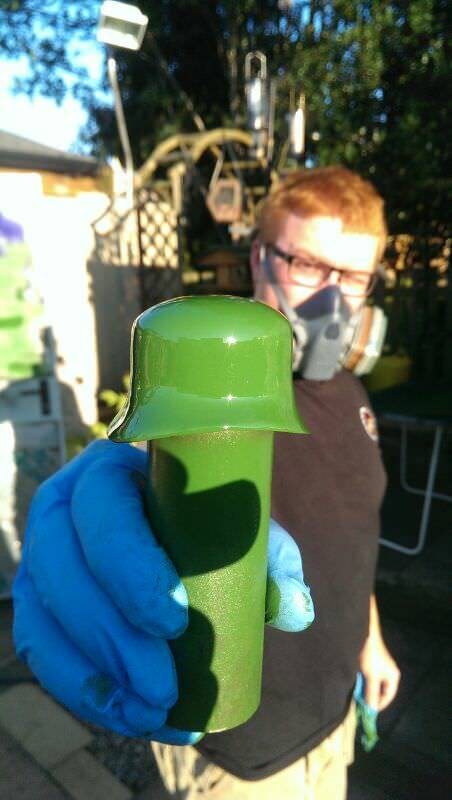 The other bits can now go into either black or green topcoat. 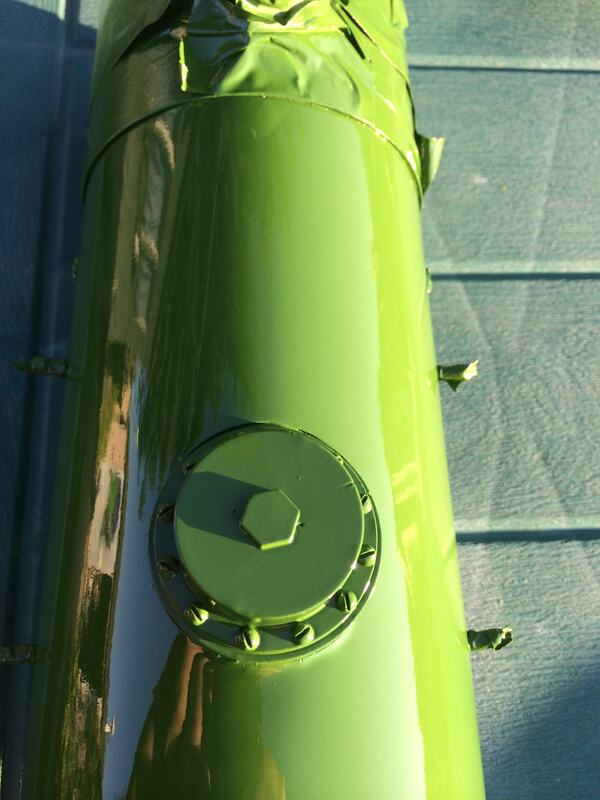 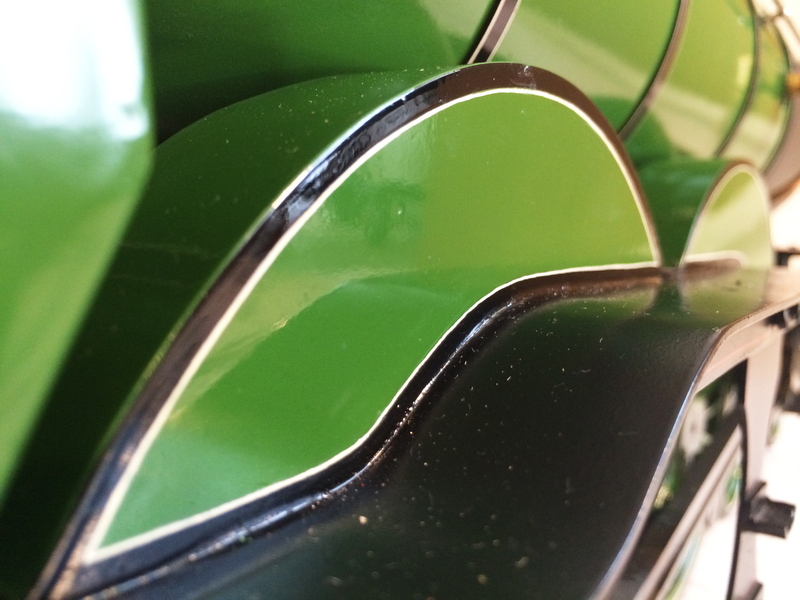 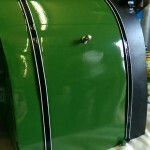 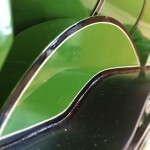 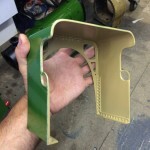 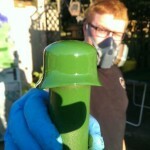 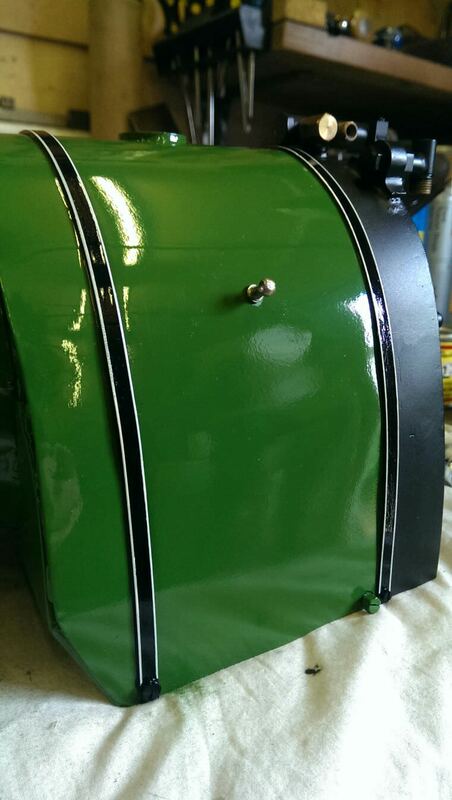 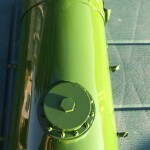 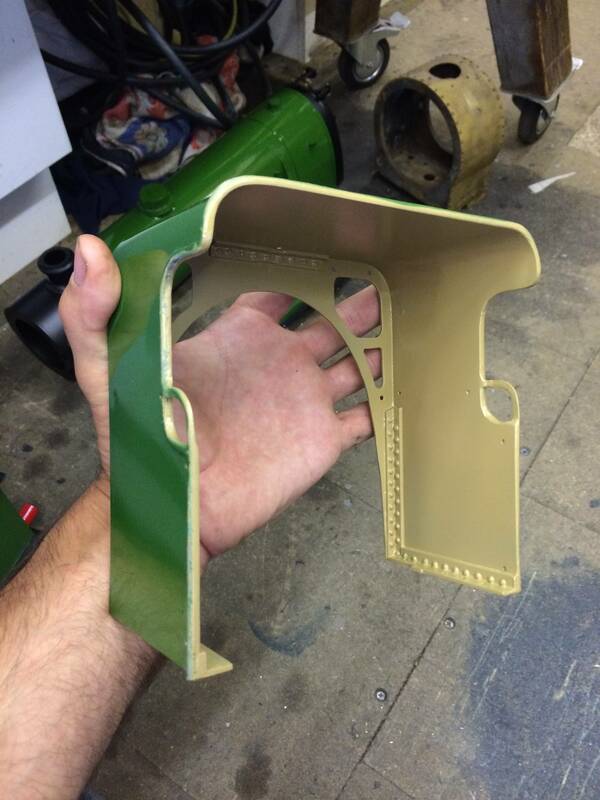 In this case, satin for the black, gloss for the green. 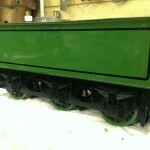 Further masking after initial coats are applied enables blacks to go ontop of greens and vice versa. 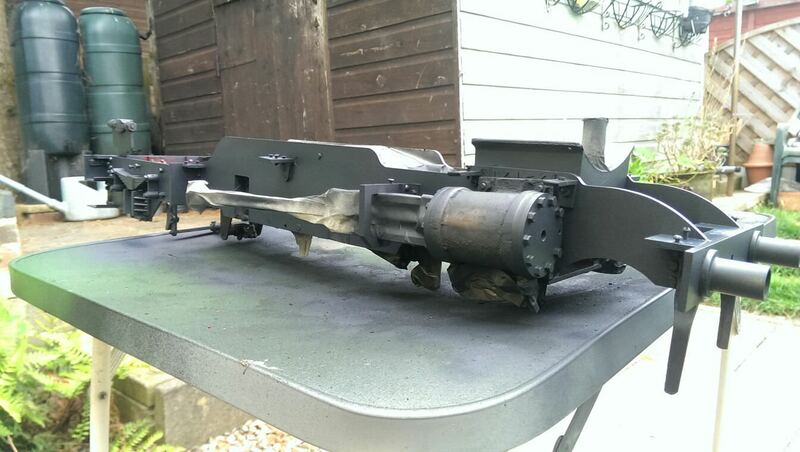 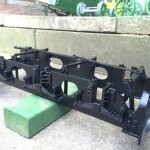 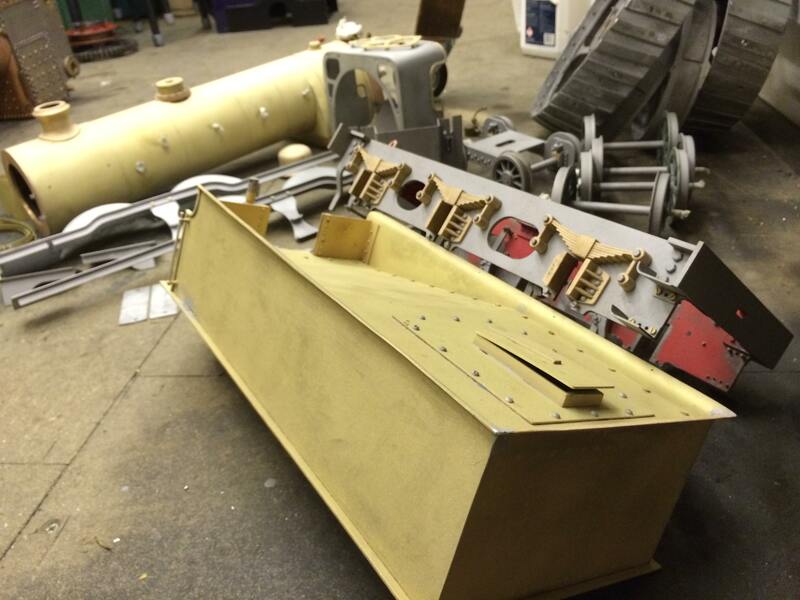 Meanwhile the chassis has also been following suit, first being stripped, cleaned up, primed and painted. 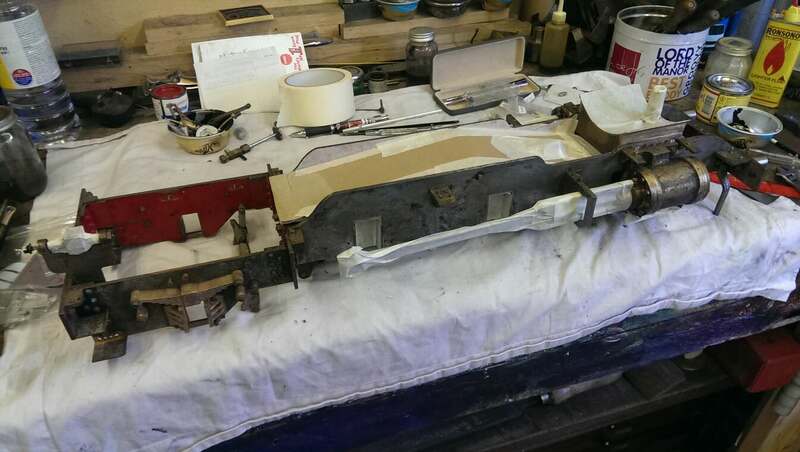 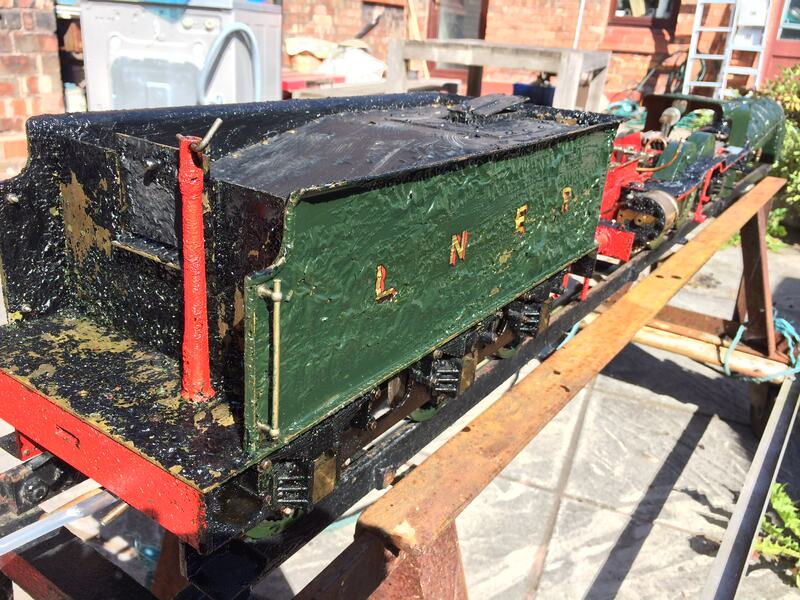 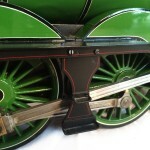 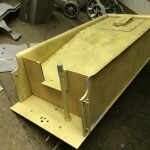 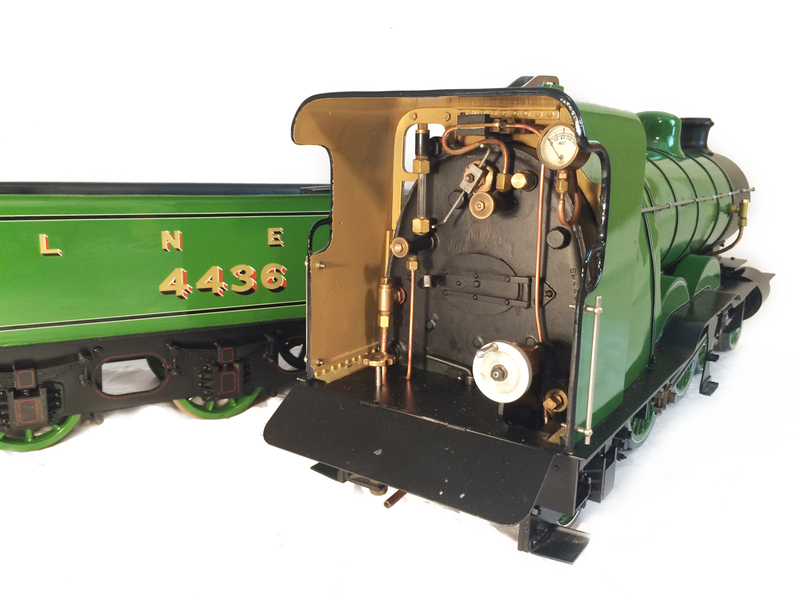 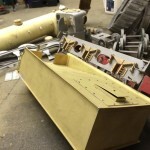 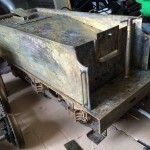 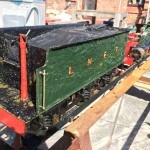 Because of the specification for this particular re-paint, it wasn’t possible to take the time to completely strip the chassis down, so it was carefully masked, and finished appropriately. 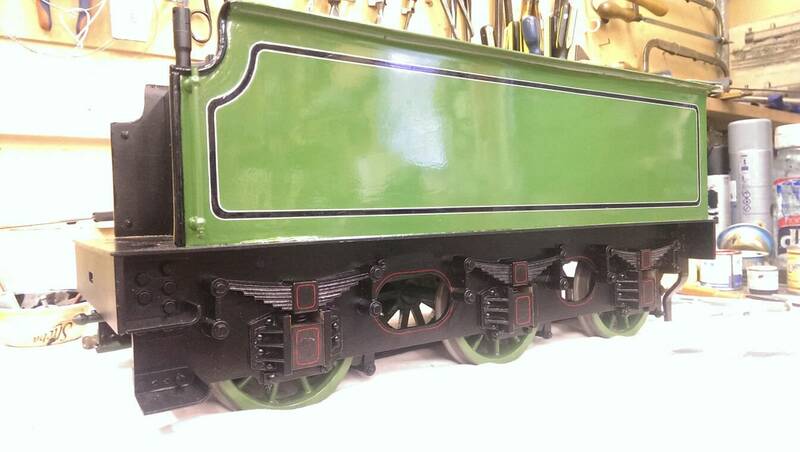 Into the final detailing stages now. 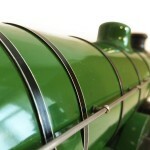 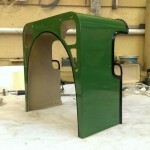 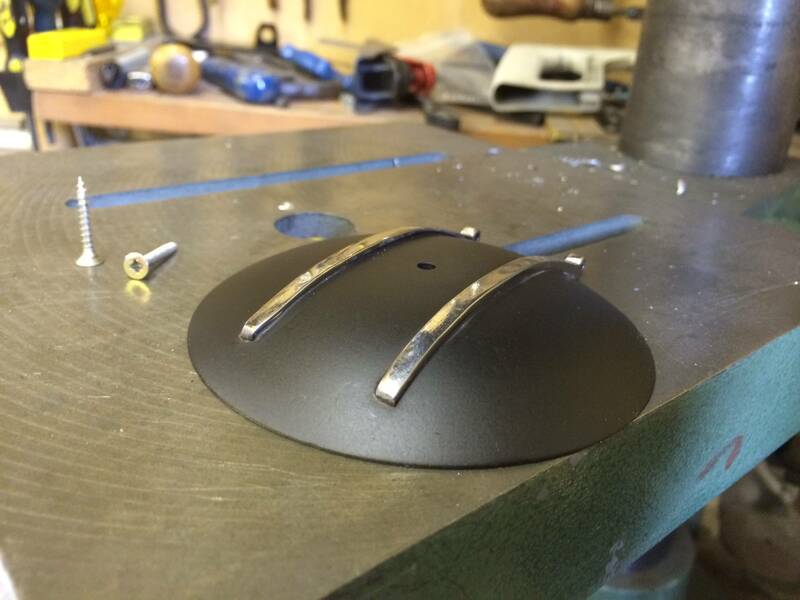 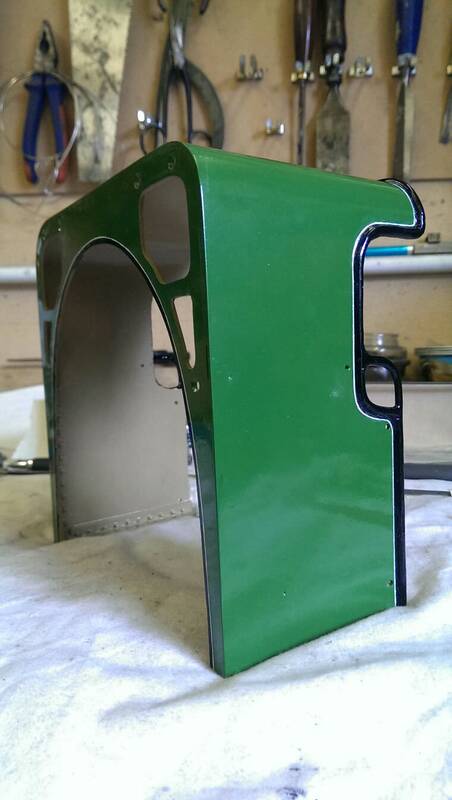 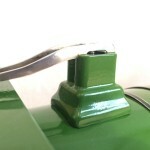 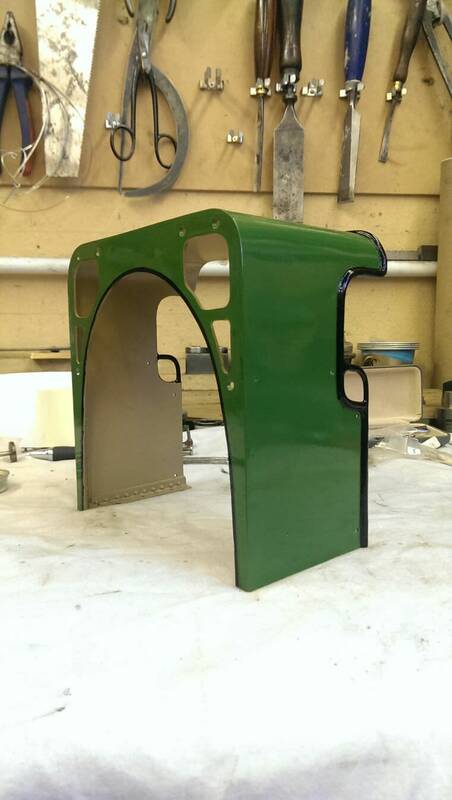 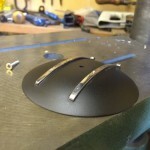 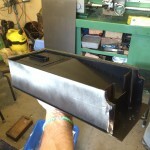 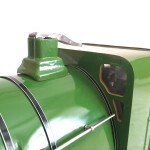 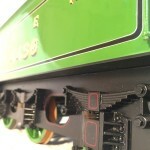 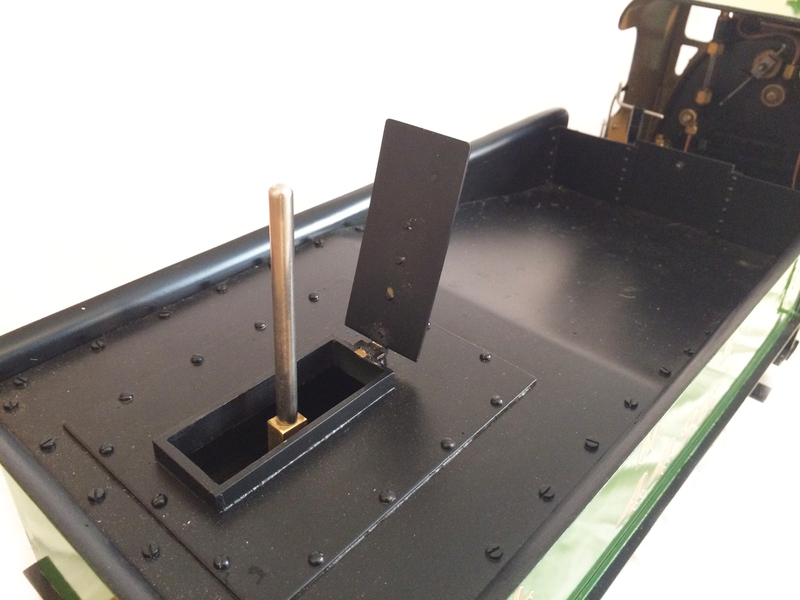 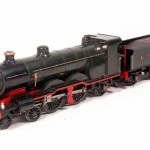 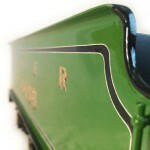 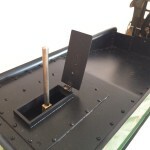 The glossy black lining and edging can be applied, as well as details like the colour of the inside of the cab. 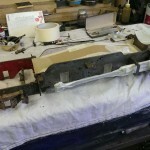 The lining can begin properly at this stage. 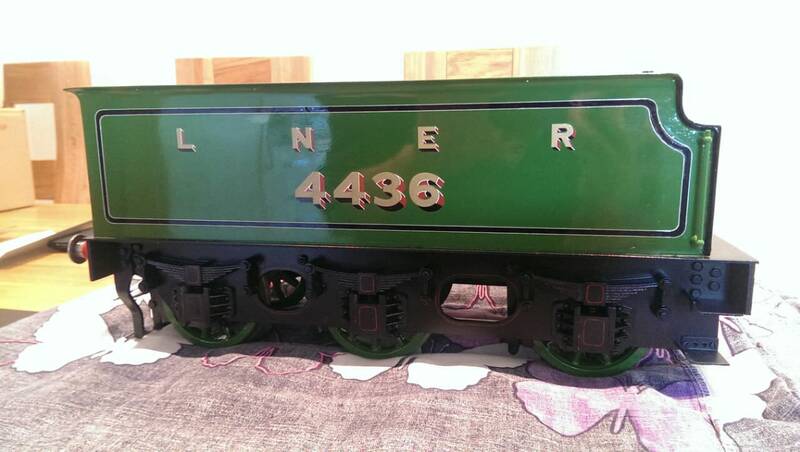 The tender is first marked out by hand with a couple of thin guide paint lines between which the main black line can be filled in with a fine lining brush. 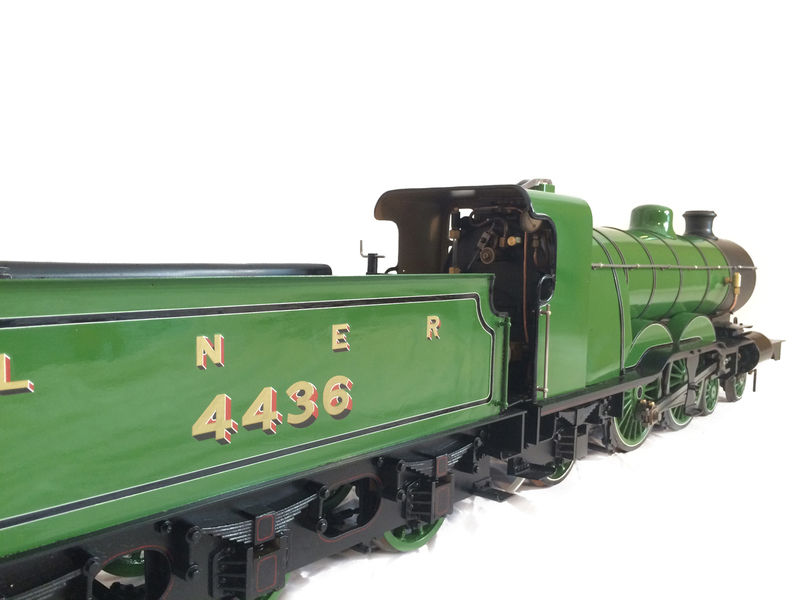 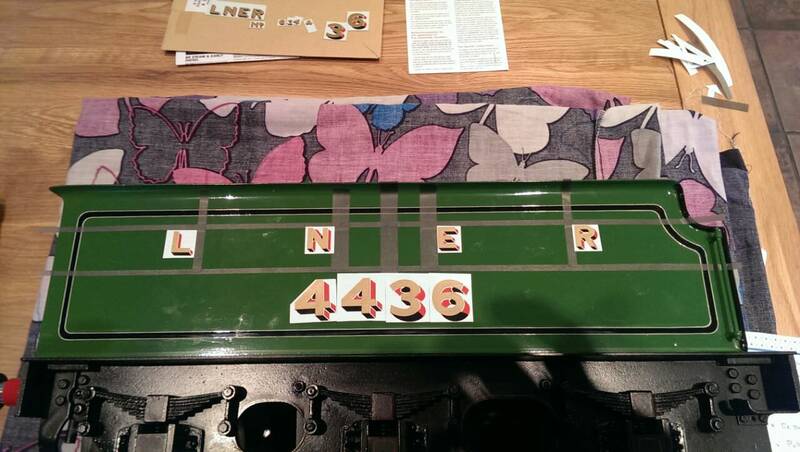 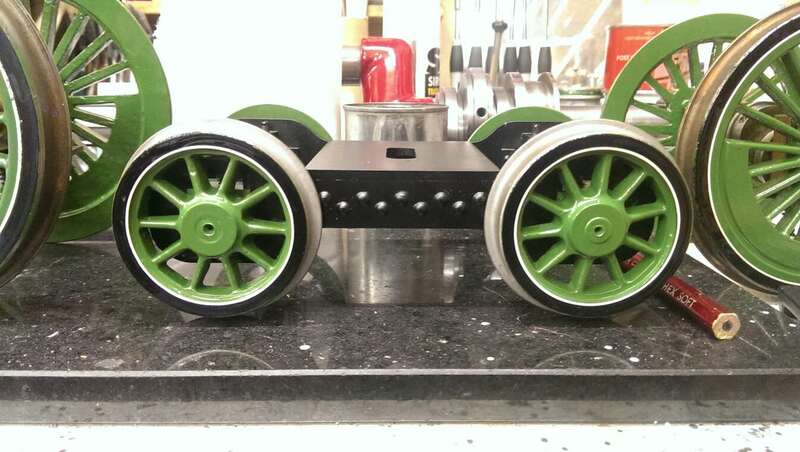 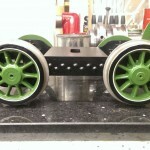 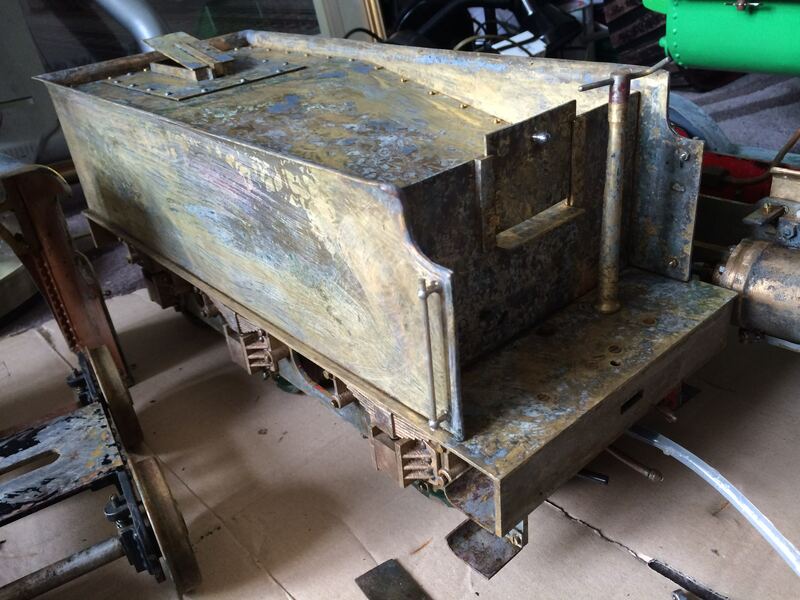 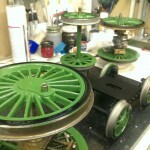 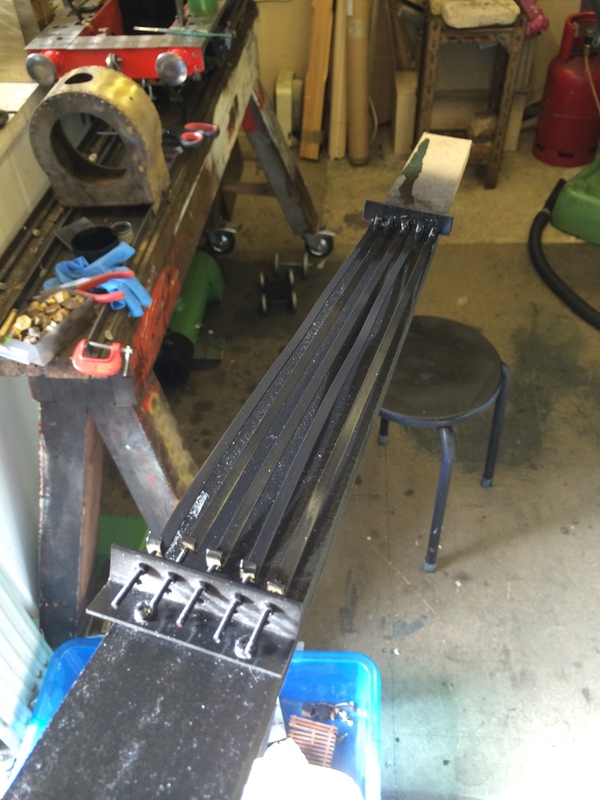 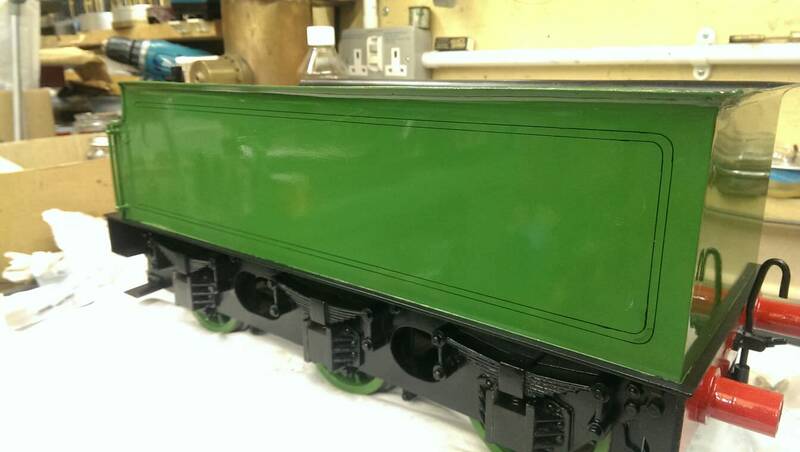 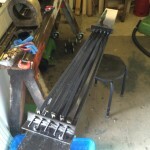 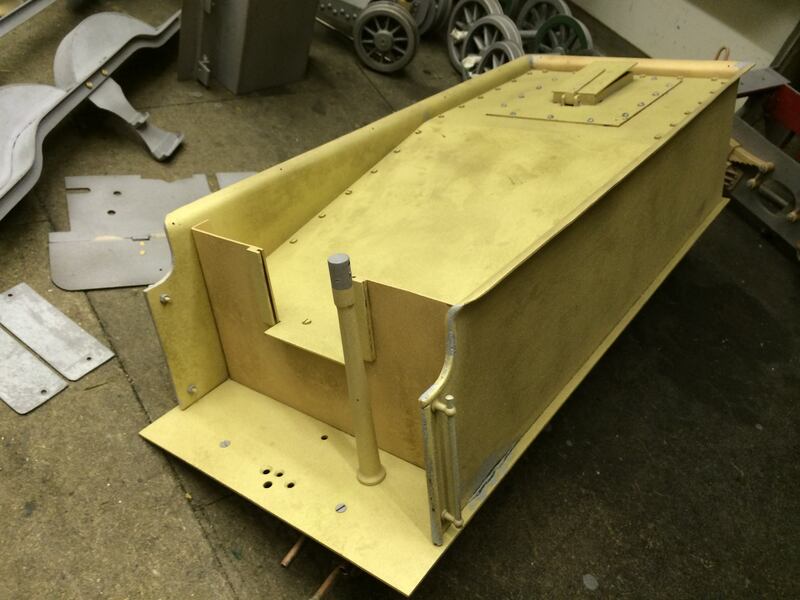 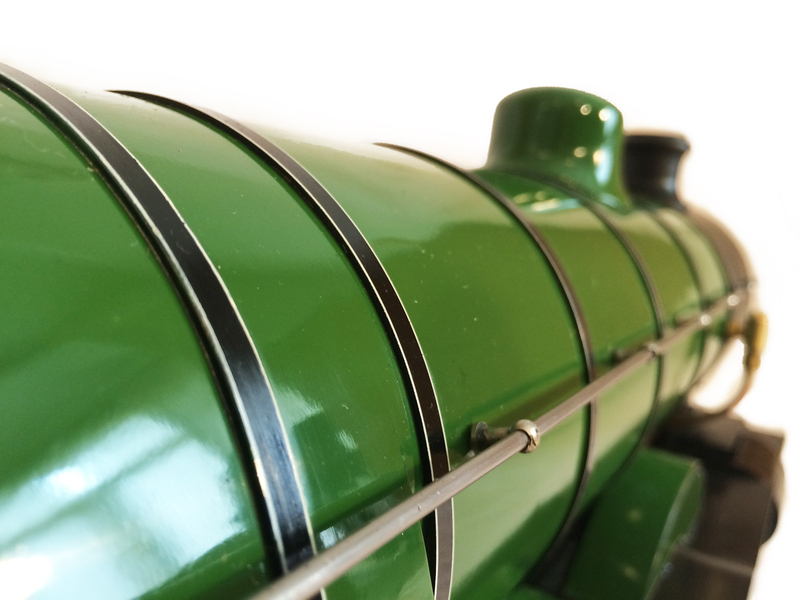 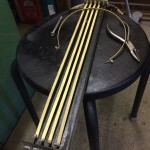 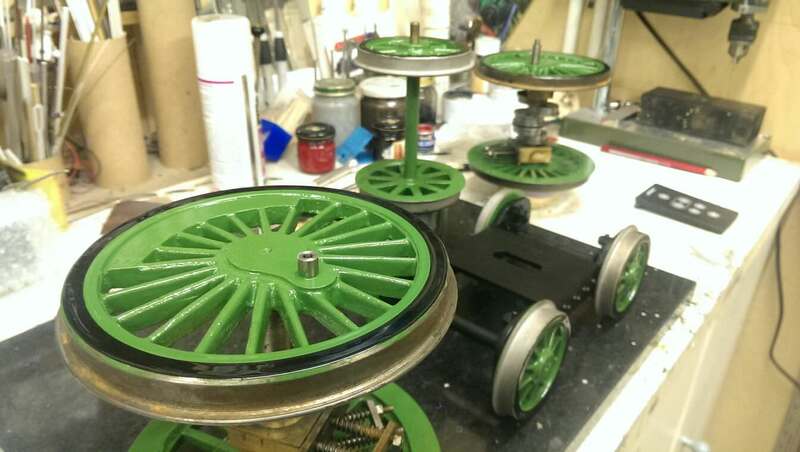 ….and the white lines can begin to go onto the cab, running boards, boiler bands and wheel rims. 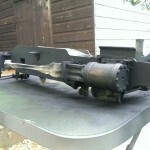 So the reassembly then begins in earnest. 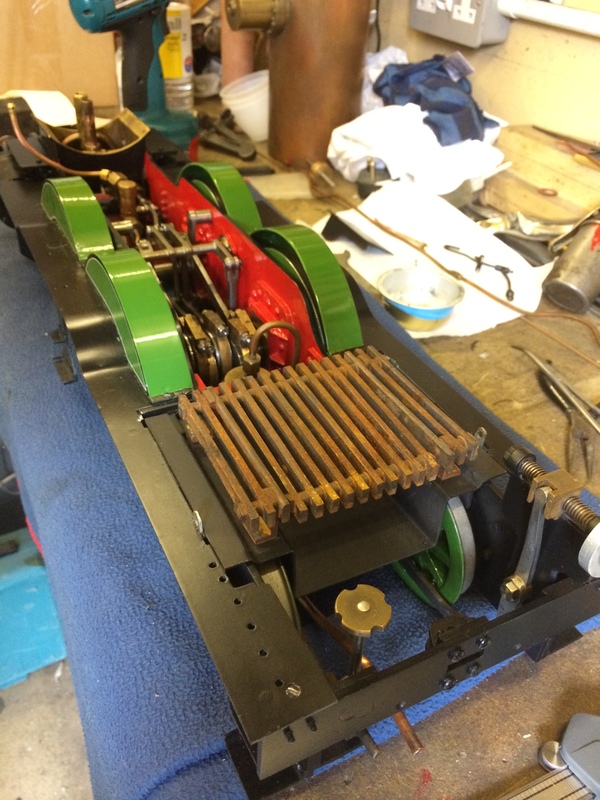 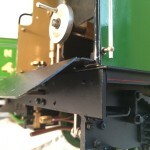 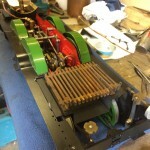 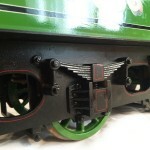 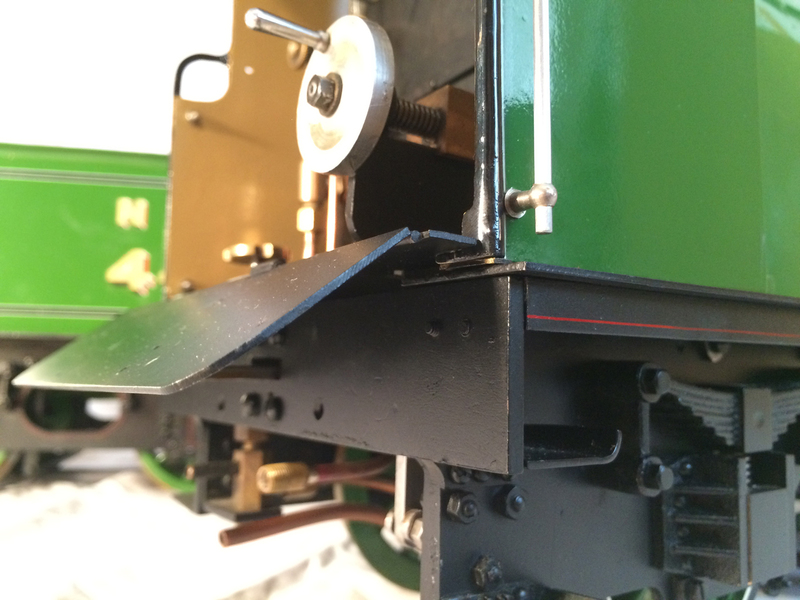 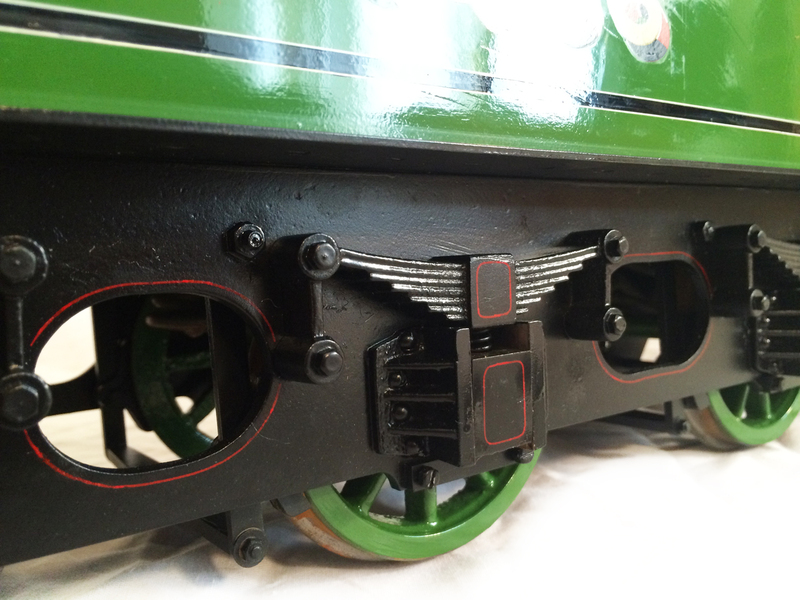 The running boards go back on, as do the ashpan and grate, which fasten to the chassis before the boiler drops in place over the top. 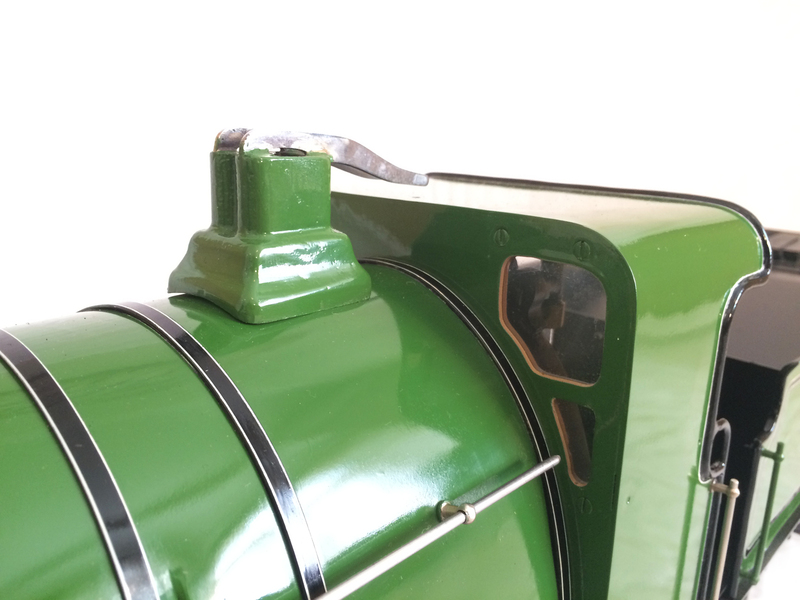 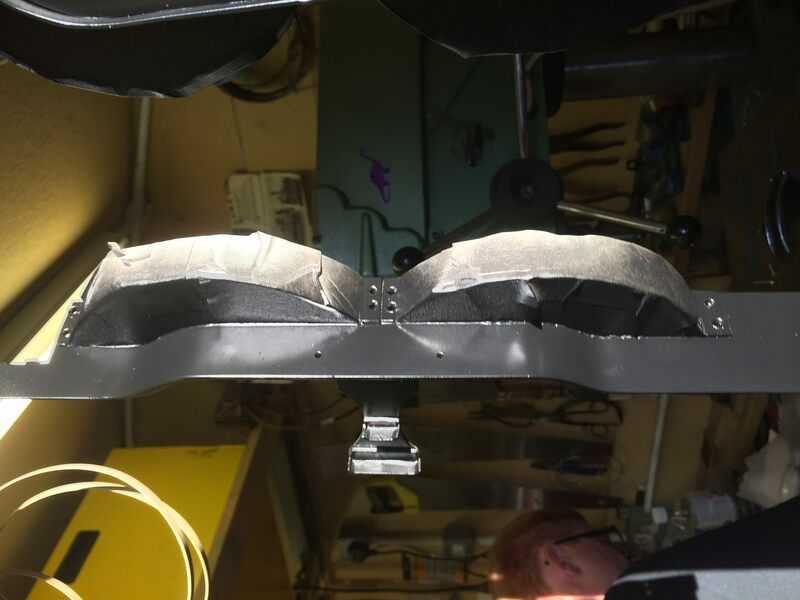 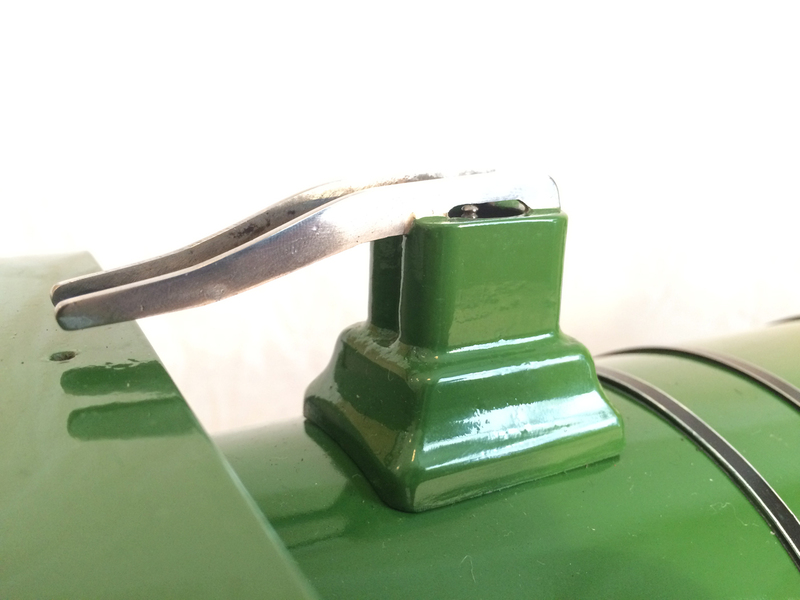 The boiler retention clips originally bolted onto the outside of the cladding at the base of the fire box, but we have tweaked them to slide up between the boiler and cladding to neaten the whole thing up a little. 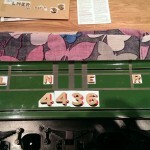 Nearly there now. 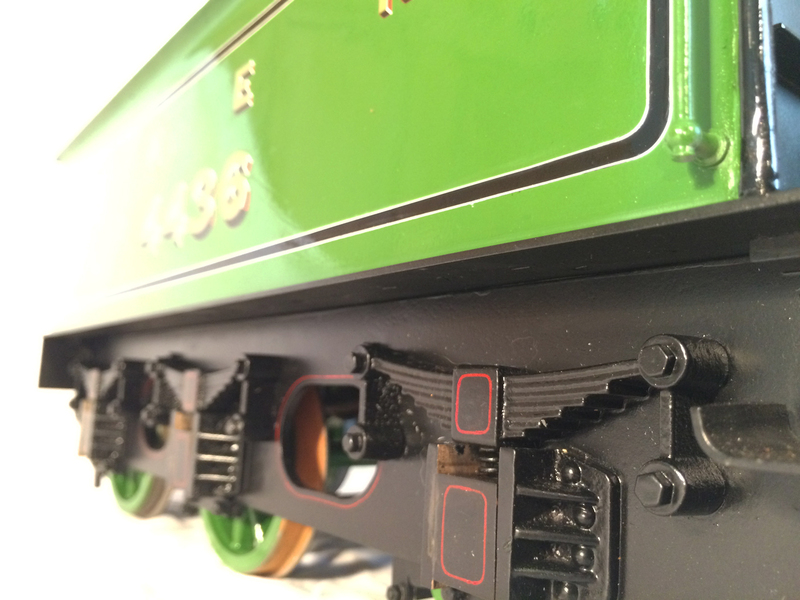 The transfers go on the engine and tender. 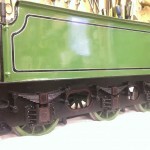 And so here we are, the final job all finished. 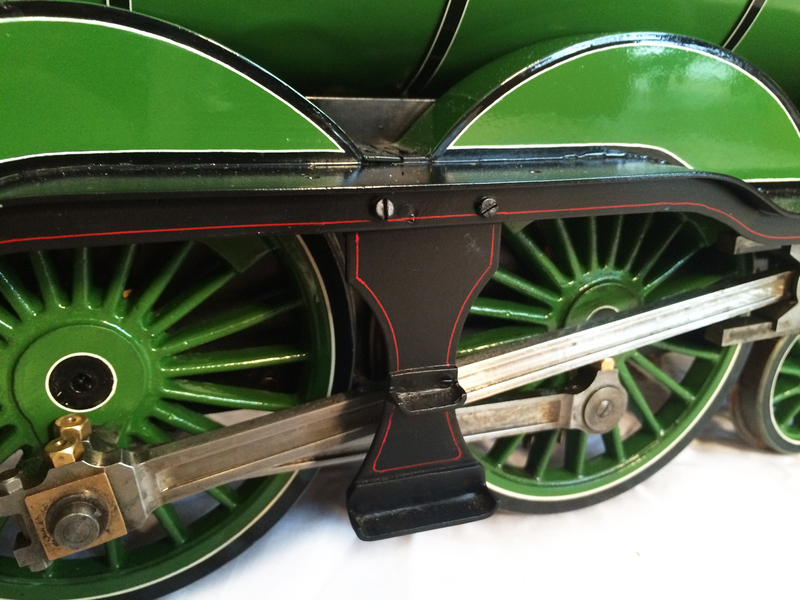 A little selection of photos to show it all done and ready to go to Sam, the model’s proud new owner.